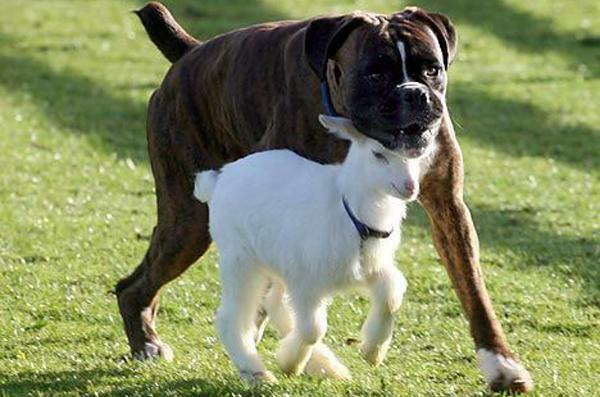 Here are some unusual animal friendships to warm your heart. Lions and Tigers and Bears, Oh my! No, we're not in Oz, but in Georgia, at the Noah's Ark Animal Sanctuary. 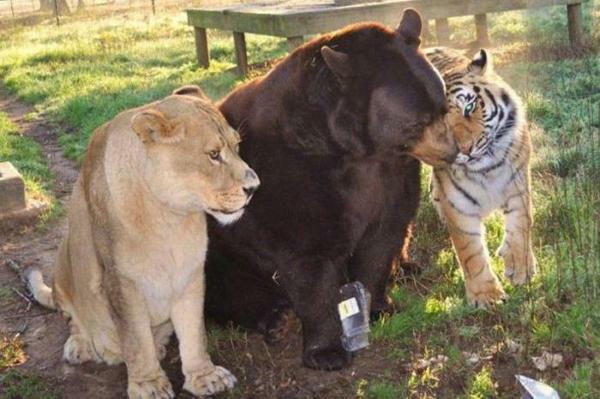 Leo the lion, Shere Khan, the tiger, and Baloo the bear were rescued from a drug dealer who had them as pets. Because the trio grew up together, they bonded and are now inseparable. 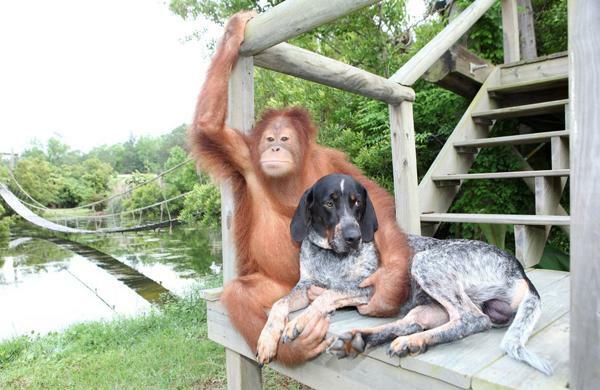 Suryia, the oragutan, and Roscoe, the hound dog, met four years ago. Suryia was depressed over losing his parents and vets were worried he might die of sadness. Roscoe was abandoned and needed a home. Suryia spotted Roscoe abandoned outside their zoo in North Carolina. The two friends instantly bonded and have been together ever since. 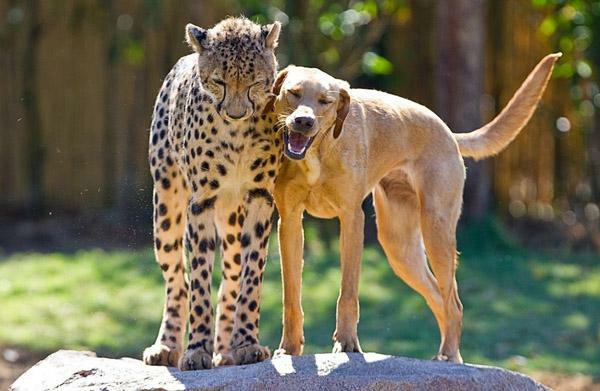 This is Kasi, the cheetah, and Mtani, the dog, at Busch Gardens in Florida. Kasi was orphaned as a kitten and needed a companion, so they found Mtani, a 6-week old Labrador retriever at the local shelter. 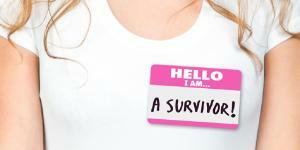 Kasi means 'speed' in Swahili and Mtani means 'close friend'. This is Lilly, the goat, and Billy, the boxer, at their home in England. Lilly the runt of her litter was abandoned. Billy took over parenting duties and they are now constant companions. 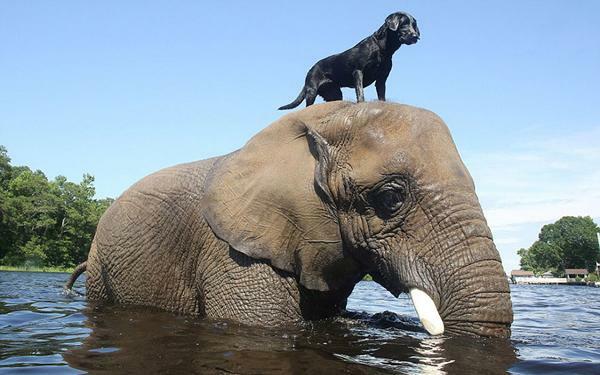 This is Bella, the black lab, and Bubba, the African elephant, playing in their home in Myrtle Beach Safari in South Carolina. Bubbles was brought there after both her parents were killed by poachers. Bella was abandoned by a contractor hired to build a pool for Bubbles. The pair now constantly play together, sometimes even playing fetch with Bubbles thowing a ball with her trunk. 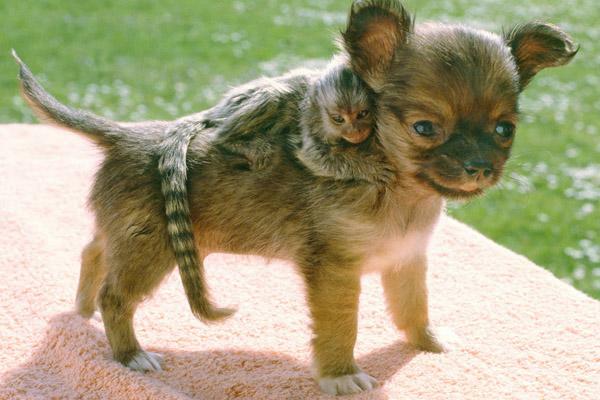 This is Sam, the Chihuahua, and his baby marmoset in Norfolk, England. The baby marmoset was born in a zoo in England, but because the adult marmosets began to fight, they decided to remove him. To get him outside, they gave him to Sam who would walk around the zoo. 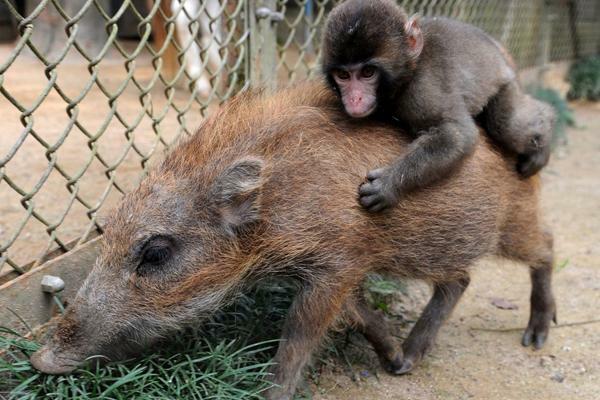 This pair is Miwa, a macaque, and Uribo, a wild boar, at the Fukuchiyama Zoo near Kyoto, Japan. Miwa was rejected by his parents and needed a companion, so they paired him up with Uribo a wild board. They take daily walks around the zoo and have become a popular attraction. 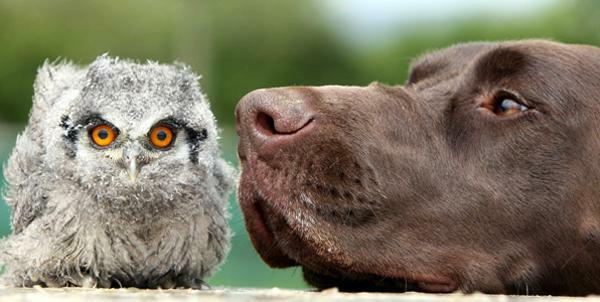 This is Kiera, the dog, and Cherub, the owl, at their home, the Devon Bird of Prey Center in England. Cherub was found orphaned and taken to the center. Kiera was the center's dog. When the pair met, they instantly bonded. Now, when Cherub goes to visit local school, Kiera will wait at home anxiously until his friend returns. 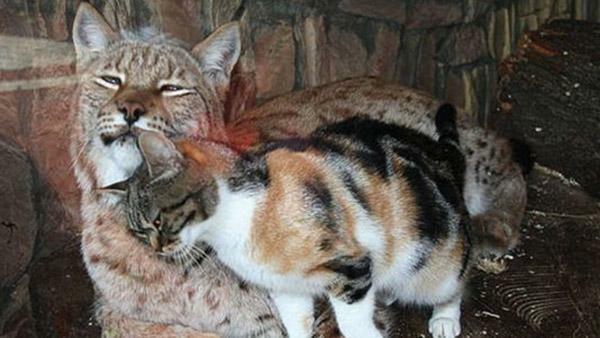 This is a European Lynx and a calico cat at the St. Petersburg Zoo in Russia. One day, the homeless cat wandered into the Lynx's pen looking for food. 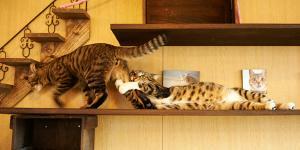 The Lynx didn't reject the cat and now the pair are a popular attraction. 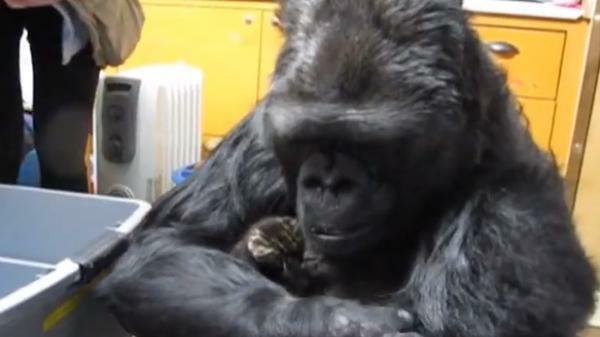 Koko is a research gorilla who knows over 1,000 words in sign language. What she is cuddling in her arms is Smoky, her kitten. Smoky was Koko's birthday gift that she had used her sign language skills that she had wanted.